The Apple co-founder on Sunday could be seen browsing the company's flagship shop on Regent Street, according to ifoAppleStore. This immediately lead "to speculation that he’s in town to finalize an exclusive iPhone contract with an undisclosed UK cellular carrier," the site reported. ifo added that the Regent Street Concierge bar will be closed next Monday, July 16th, providing Jobs & Co. the perfect opportunity to announce a UK iPhone deal at the store. Following an extremely successful iPhone launch in the United States, prospective European carriers are reportedly torn between the additional revenue the Apple handset would generate and the strict set of concessions Apple is demanding in return. In particular, a report issued by Current Analysis last month singled out Orange as a likely shoo-in for the iPhone contract in Europe given it's significant EDGE coverage in the region. The report, however, went on to cite unnamed sources from several European carriers who said that they had spoken to Apple and found the company "unbelievably arrogant,” making demands that “simply cannot be justified, no matter how hot the product is." For its part in the ongoing speculation, American Technology Research has cited its own sources in saying Vodafone -- with a vast subscriber base in excess of 200 million -- stands the greatest chance of landing a full-blown European iPhone contract. A recent peak into the resource files of Apple's latest iTunes update appears to confirm that consensus, having revealed pre-placed "default carrier" images for both Vodafone and T-Mobile. Last week, the Rheinische Post confidently stated that Deutsche Telekom's mobile phone unit T-Mobile had clinched a deal to bring the Apple handset specifically to Germany. At the same time, a report by the Times Online claimed that O2 had secured the exclusive rights to offer iPhone in the UK. O2, however, quickly denied the Times' report, leaving Vodafone as a potential candidate to provide iPhone to parts of Europe. Talk about the pot calling the kettle black! Here, you have some of the least customer responsive companies on the planet not getting their way--- and not liking it. I would have to assume that Apple was trying hard to get a decent deal for the consumers-- one that would attract them to the carrier as well as an inducement to buy the iPhone. The reporting of it hints, too, that Apple most likely was "arrogant" in an, 'as expected' sense, rather than simply standing its ground for a good deal. It wasn't that long ago that the phone services in the UK and Europe were abysmal. Service was spotty, the attitudes of the telcos made "arrogance" seem like a virtue and the costs were extreme by comparison to US pricing. Indeed, SMS became popular in the EU precisely because talking-- what phones were all about, after all-- was too costly. Hence, the lesser usage and perceived need of this service in the US. That has since changed somewhat as it has become a stealth tool of communication, especially in classrooms and boardrooms!!! LOL. Let's hope a good deal is struck in the EU that is customer friendly. This phone is awesome and though it cannot change the linens and do the laundry, it is the most capable phone I have seen. It is so close to being that stunning PDA we have been wanting from Apple, that lends its own frustration since you just want it to do ALL those things. 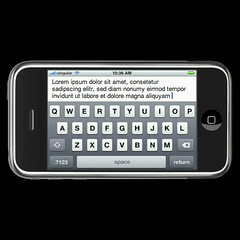 I want ePocrates on my iPhone!!! Hopefully soon? 3G or your head Jobs, you decide? Having now used it for 10 days, and getting sense of the sheer sweat and tears and genius that must have gone into the product design, I can see why Apple does not want to muck up the user experience in the least - i.e., can't leave it to a carrier and its decisions to what to allow, what to cripple, etc. I was someone who had earlier thought that Apple was generally being pretty arrogant about this, but that was before I became a user. I now completely understand. It's really simple --actual use basically changes everything you may have believed about the iPhone. There's no other way to say it. Also, IMHO, 3G is not likely to be as much of an issue as I had originally thought. For everything but the internet, it's basically unnecessary. Even for the internet, 2.5G is a bit slow, but not bad overall. (Needless to say, it is really fast with wifi). If the choice was between [3G + fast internet] versus [2.5+ slower internet + reasonably fast all else + slower battery drain + thinner form factor], I may have gone with the latter also. Unfortunately, I think it increasingly likely that Apple will try to release 'iPhone 1' (2.5G) for the European (late '07) launch, and 'iPhone 2' (3G) will wait until 2008 and the Asian launch (simply because the iPhone has a snowball's chance in hell in Japan and Korea, both massively 3G nations, without it). Except in Europe it's mostly 2G, not 2.5G if there's no 3G as very few carriers bothered with EDGE and the competition's phones are that higher spec by comparison than the USA's competition. Steve Jobs should get his own reality tv series, he's already pretty close to being a celebrity. I'm exactly 6 ft. tall, and I have no problems typing on my iPhone. Good thing I didn't grow another inch taller. I'm probably just a victim-in-waiting for Apple's fiendish plans to sell a shitload of extra iPhones to people like me who wanted the iPhone now, despite its limitations, and who will still very likely shell out their cash yet again when the 3G iPhone 2 comes along. If Apple keeps putting out a new iPhone every year, and each iPhone requires a two-year service agreement, in a decade or so I'll be locked into a single carrier for the rest of my natural life. Got the chance to use it for about 20 minutes this weekend... biggest problem for me was lack of landscape text entry for all apps. Check out the screenshots of using the landscape keyboard with Safari, and you'll see why it's not suitable for all apps... no room at the top of the screen for much more than the URL bar. Pfft. I'm 6'3", and have large hands even for my height. It took a bit of practice, but in 10-15 min I had an insanely good typing accuracy. The predictive/corrective algorithms are like freaking magic. After a bit, I decided to just 'trust the keyboard' like they say, and I had one typo per sentence, on average, with no pauses, corrections, or redos. Fixing them was then trivial. I'm sure if I actually *owned* one, I'd get even better. You're yankin' his chain, right? "I loved it over there. I was walking down the street, thinkin' to myself, 'Whoa... I'm like almost normal height over here'." Don't worry... with crappy Western-style eating habits/food becoming more common over there, within a generation or two they'll be up to American heights... and they'll have our heart attack and obesity rates too. Remember, you'd have the option of using either the portrait keyboard or the landscape. It wouldn't be 'either-or'. No doubt some would take the wider key spacing/larger keys over being able to see more of the doc/app they were typing into. I got to play with an iPhone over the weekend, and the portrait keyboard is indeed a bit of a chore. The keys are small and very tightly spaced, its easy to hit multiple keys or the wrong key. And I type 70 wpm on a regular keyboard. Yeah, very likely it gets better as you get more used to it. I believe that. But I doubt it ever gets to be really good. Just... too... small. Hopefully Steve will visit a Toronto-area Apple Store in the next couple of weeks. If anyone has a spare iPhone gathering dust, send it my way pronto. Could you give us an update (if you know) on the status of Wi-Fi Hotspots in the UK, increasing in number or not, free and pay-for? Rest of Europe? Really? I'm 6'2" and adapted rather quickly. I was amazed at how few mistakes I was making after about an hour of typing on it. I have a brand new 8GB model that I'm going to list on eBay tonight. If interested, make me an offer (via PM) that I can't refuse but do it quick as I'm going to list at about 8pm EST.